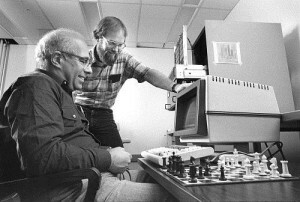 The chess-playing computer HiTech was designed from 1986 to 1988 by student Carl Ebeling (r) under Professor and Senior Master Hans Berliner (l) at Carnegie Mellon University. 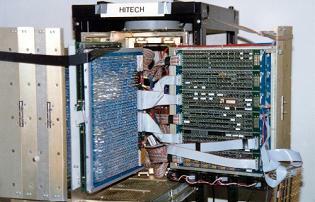 HiTech’s custom hardware could analyze 200,000 moves per second and was the first computer to be rated over 2400. HiTech, the chess-playing computer from Carnegie-Mellon University, triumphed easily in its four-game match against Grandmaster Arnold Denker yesterday, winning the last game in 23 moves. The victory marked the first time a chess program had beaten a grandmaster. Most experts agreed that Mr. Denker, noted for his imaginative combination play and sacrificial attacks, was badly off form. It also was pointed out that he is 74 years old and does not play very much chess these days. The final score for the match was 3 1/2 for HiTech to 1/2 for Mr. Denker, who admitted that the victory was an impressive achievement for a computer program. Mr. Denker had worked out a draw with HiTech Thursday night but had been unable to capture a point in the three succeeding games. HiTech previously had achieved victories over international masters, a lower ranking than that held by Mr. Denker, who was the United States champion from 1944 to 1946. There was none. HiTech remorselessly pressed on, ending with a murderous attack that forced Mr. Denker’s resignation in 23 moves. A purse of $7,000 was involved in the game, which was played at the New School on West 12th Street. HiTech’s moves were relayed from a mainframe computer at Carnegie-Mellon in Pittsburgh to a portable terminal next to the game board. Dr. Hans Berliner, a computer scientist and head of the team that created HiTech – the strongest chess computer ever devised – was part of the group of analysts who kept a running commentary on the game. The others were Grandmaster Edmar Mednis and the television chess personality Shelby Lyman. ”I was very pleased with the way HiTech played, and I’m very hard to please,” Mr. Berliner said. ”Hitech played this last game on a grandmaster level.” Grandmaster Mednis agreed that HiTech would give any player in the world a real struggle, although there was no doubt among the experts that HiTech was not yet on a strong grandmaster level. Dr. Berliner at one time was one of America’s strongest chess players. He came in high in various tournaments, and he also was the World’s Correspondence Chess Champion. He and his associates at Carnegie-Mellon are working on an improved model of HiTech that, he says, is about three years in the offing. The present machine can scan 200,000 positions a second. Mr. Berliner refused to say what HiTech’s offspring would be able to do. By Arthur Bisguier, an international grandmaster and former United States champion who has won or shared the US Open title five times and has been active with youth chess. A new milestone in computer chess was achieved in late September when HiTech, the chess-playing computer from Carnegie-Mellon University in Pittsburgh, decisively triumphed, 3.5/4, in its four-game match against grandmaster Arnold Denker. Denker, a former United States champion (1944-46) who was famous for his swashbuckling style and sacrificial attacks, is only semi-active nowadays and was unable to cope with the remorseless and diabolical accuracy of the chess program of the mainframe computer of the Carnegie-Mellon team, headed by Dr. Hans Berliner, a computer scientist and himself a former world champion correspondence chess player. After drawing the first game, Hitech went on to win the final three contests. According to Berliner, the computer scans 200,000 positions a second, which often enables it to analyze and assess certain variations that mere mortals discard out of hand as violating certain general rules that humans tend to treat as gospel. An excellent case in point is the wonderful queen check from the edge of the board which HiTech came up with on the ninth move of today’s featured game (the fourth and final in the match). Experts are generally loath to develop the queen, lest it will present a target and will be the subject of an attack that will often cost much time. In this game, though, there is a neat contrast between Denker’s early queen moves, which lost time while he isolated the White queen’s pawn, and HiTech’s queen check, which was the beginning of a remarkable attacking plan, perfectly calculated by the computer HiTech and obviously underestimated by the former US Champion. The match, which was contested at the New School in New York City, offered a purse of $7,000. The prize money went into a trust fund established by Carnegie-Mellon. A. The sharpest continuation. Often seen here is 2….Nf6, but the most discreet continuation is probably 2….e6, preparing for …d5 (i.e., 3.d4, d5, and now if White plays 4.exd5, Black has the option of recapturing with the pawn, while if 4.e5, we have an Advanced Variation of the French Defense). B. White zeroes in on f7 before Black castles. C. Black now has no less than five interpositions, none of which is satisfactory. For example, I:9….Nc6; 10.d5; II:9…. Qd7 is refuted by either 10.Bxf7+, Kxf7; 11.Ne5+, winning the queen, or 10.Bb5, Nc6; 11.Ne5. III:9….Bd7; 10.Qb3, O-O; 11.Ne5. Now if Black defends f7, White plays 12….Qxb7; and IV:9….Nfd7; 10.Bxf7+ is even stronger than V, the text continuation. Black had to try 9….Kf8, when his prospects remain very bleak, as he is several tempi behind in an open position and has forfeited the castling privilege. D. A stock combination frequently seen in positions of this ilk, but this one has a novel twist. E. Black loses his queen after 11….Kf8; 12.Ne6+ and his king succumbs after 11….Kg8; 12.Qb3+ or 12.Qc4+, followed by mate on f7. F. This move is a stinger, which Denker appears to have overlooked in his calculations. He probably anticipated only the 13.Nxg7+, Kf7; 14.Bh6, Ng4 line, which is probably good for Black, since White’s advance pieces are somewhat shaky. G. This seems necessary to guard against White’s threat of 19.Rxe7, Qxe7; 20.Bxf6. H. White prepares to pry open Black’s king defenses. If the Black rook moves to a6 or b6, 21.d6 bisects and dissects Black’s position. I. The HiTech computer always selects the shortest and most accurate finish possible. Now Black cannot stop 24.Qe8 mate without bringing on catastrophic loss of material.